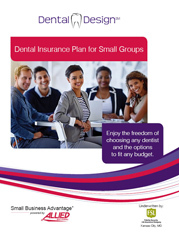 Designed for groups of 2-99, Allied™ Dental Design offers affordable dental insurance benefits and many plan options that allow groups to choose the type of coverage that best fits their needs and budget. Insureds can choose any dentist for services without a penalty. However, the Aetna Dental PPO is automatically included. 100% preventive care benefits with no deductible. Orthodontia benefit option for all size groups. Takeover benefits available for all size groups. Choice of deductible and benefit maximums. Dental Design offers a vision plan option for plan participants and their dependents. Choice of Silver, Gold or Gold Materials-Only plans. Exams, lenses, frames and contacts covered. Dental Design's dental and vision policies are underwritten by Fidelity Security Life Insurance Company. Vision plan benefits are administered by National Vision Administrators; Allied National provides eligibility and billing administration.